The injury bug derailed Bianca Andreescu's impressive run on Monday. The rising Canadian tennis star's win streak was snapped at 10 matches after a 6-1, 2-0 loss to No. 21 seed Anett Kontaveit of Estonia in a fourth-round contest at the Miami Open. The injury bug has derailed Bianca Andreescu's impressive run. The rising Canadian tennis star's win streak was snapped at 10 matches after a 6-1, 2-0 loss to No. 21 seed Anett Kontaveit of Estonia on Monday at the Miami Open. The 18-year-old from Mississauga, Ont., retired from the fourth-round match with a right shoulder injury, which has been an issue throughout this tournament. On the men's side, No. 20 seed Denis Shapovalov of Richmond Hill, Ont., beat Russian qualifier AndreyRublev 6-3, 7-6(5) later Monday in a third-round match. 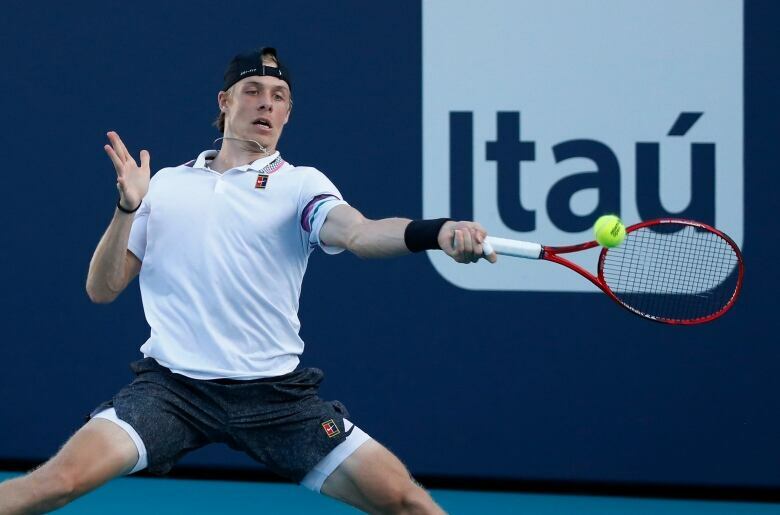 The 19-year-old Shapovalov will play another young star, eight-seed Stefanos Tsitsipas of Greece, on Tuesday. "I tried to get as much treatment as I can," Andreescu — who described her shoulder as feeling tight — told reporters afterward. "I thought it would be OK, but obviously it just got worse as the match progressed." Playing her WTA Tour-high 35th match of the season, Andreescu showed signs of fatigue as she suffered her first straight-sets loss of the campaign. She is now 31-4 this season, getting her ranking up to No. 24 after starting 2019 at No. 152. 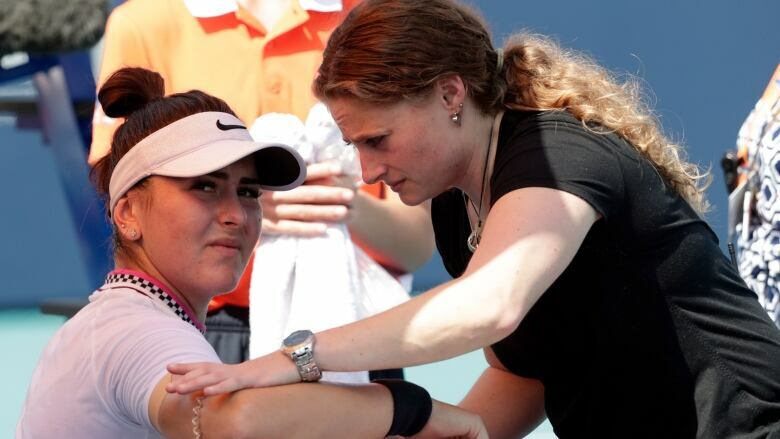 "I have played so many matches, I guess this is just a way of my body telling me that it's had enough," said Andreescu, adding she had been told by doctors it is not a serious injury. "It's disappointing, but it's part of the sport." The match was halted for about 90 minutes when rain started to fall during the second game. With Andreescu serving and with advantage upon return, she double-faulted twice and then lost another point to give Kontaveit a break and a 2-0 edge. When Andreescu called for a visit from coach SylvainBruneau after falling behind 4-1, the BNPParibas Open champion was breathing heavily and did almost none of the talking during the timeout. Andreescu called for the trainer to look at her shoulder after the first set, something she did several times during a three-set win over three-time Grand Slam champion Angelique Kerber on Saturday night. The Monday retirement continued an eventful stretch for Andreescu. After losing to Andreescu in the third round, Kerber called the Canadian the "biggest drama queen ever" before a quick handshake. The German, who also lost to Andreescu in the BNP Paribas Open final last weekend in Indian Wells, Calif., took to Twitter Sunday to congratulate the teen for the second victory after taking some criticism for her post-match words on social media. Andreescu had won four of her previous five matches in three sets prior to the encounter with Kontaveit. "It's been an incredible run, a Cinderella story, like a lot of you guys said," Andreescu said. "It's a dream come true, so I'm really pleased." Kontaveit, with a similar ranking to Andreescu, has played 17 matches this season, less than half of the Canadian's total. "I didn't think she was going to [end the match earlier], but she's had so many matches and I'm sure she's fatigued," Kontaveit said. "So, yeah, you know, she's had such a great run, and I give her a lot of respect for that." Andreescu said she'll skip a tournament next week in Charleston, S.C., but plans to play for Canada in a Fed Cup tie on clay in the Czech Republic, April 20-21. Felix Auger-Aliassime of Montreal will face No. 17 seed Nikoloz Basilashvili of Georgia in a fourth-round match on Tuesday. Shapovalov also remains alive in doubles with partner Rohan Bopanna of India, having reached the quarter-finals. In women's doubles, the fifth-seeded team of Ottawa's Gabriela Dabrowski and China's Yifan Xu also has reached the quarter-finals.